Medaille College purchased the home from Jeffrey Meilman in in April of 2006. 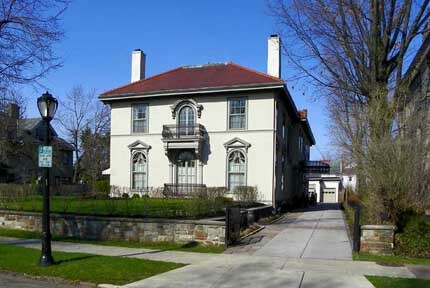 88 Lincoln Parkway, known as the Appleton House, was designed by Boston architect, Edgar Allen Poe Newcomb. It was a gift in 1909 to Benjamin Appleton and his wife Bessie Miller from her father George Miller. After her husband passed, Mrs. Miller sold the house to Charles Criqui in 1929. They contracted a Boston architectural firm to make extensive renovations, converting the living room into a library, putting an addition on the master bedroom and upgrading the heating system. Mr. and Mrs. Bradley Hurd bought the house in 1949 and were the owners during the Decorators Show House 1989 event. The Mediterranean Revival mansion with a massive, symmetrical primary façade, stuccoed walls, low pitched tile roof, and balconies with wrought iron grilles has been the home of the president of Medaille College Dr. Richard Jurasek and his wife Dr. Barbara Jurasek, since 2006.